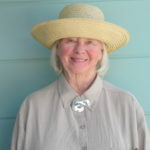 Maris Sidenstecker I (M1) is co-founder of Save The Whales, founded in 1977. Without her there would be no Save The Whales. Maris grew up in Minnesota and Wisconsin and was a journalism major at the University of Minnesota. She was managing a law office in Los Angeles, CA when her daughter (M2) designed the T-shirt that was their beginning. They took their messages and T-shirts to neighborhood and environmental fairs. Acting on a suggestion, M1 got nonprofit status for Save The Whales. She garnered publicity through print articles and television appearances where the daughter’s T-shirt and important message about whales could garner public attention. M1’s keen writing and editing skills have developed the excellent content of the website, e-newsletters, and educational materials. Click here to email Maris!